Jo Stepaniak has been influential in the vegan world for many years as both an author and editor. She’s written a number of cookbooks as well as books about the vegan lifestyle. I have 3 books (Ultimate Uncheese, Vegan Vittles Second Helpings and Vegan Deli). They were all revolutionary when released, especially the Uncheese book, which was the base for many other more popular cheese recipes. Unfortunately though, I’ve tended to ignore them over more recent and trendier books, so it was time to put that right. Although I’ve got 3 books they’re quite similar and in fact everything I tried came out of Vegan Vittles. I certainly gave it a good road test making 10 recipes over a couple of weeks so I feel like I’ve got a very good idea of Jo’s type of food. Unfortunately, a lot of what I made was stews and chillis and they weren’t very photogenic so it’s mostly just a text review. The first dish I made was Chickpeas a la King, a creamy sauce with mushrooms and peppers alongside the chickpeas. This was delightfully quick and easy. I served it with rice, and it was a good comforting dish, perhaps a touch bland but deliberately so. It reminded me of the filling my Mum used to put in her vol au vents for parties growing up and I intend to try it that way too. It was a great dish for the beginning of Autumn and a good start to cooking from this book. Next was the Chili Bean Macaroni which we both loved. Another very easy dish which would be easy to adapt to whatever vegetables you had that needed using up, it’s pasta, kidney beans, vegetables, spices and tomatoes. I will definitely make this again. After that came the Sloppy Lennies. I’m always a sucker for a sloppy Joe recipe, which is a type of stew served as a sandwich filling in a bun, or in my case, always open faced. I always love them and this was no exception. The next recipe I tried unfortunately didn’t work for me at all. The Cauliflower Paprikash seemed like it should have been right up my street. I tried silken tofu as a base for sauces years ago when I first went vegan and didn’t like it but I thought my taste buds might have adapted a bit. I was wrong. I didn’t like this at all and didn’t even touch the leftovers. The Lentil and Eggplant Goulash was a strange recipe. It didn’t have any paprika in for one thing, and although goulash can have different textures it’s usually quite soupy where this was a very thick stew. If you just think of it as a stew though it’s really very nice. It takes a long time to make but it’s all hands off. I made the lentils the day before so it came together pretty quickly on the day. It had a touch too much cinnamon in for my taste but considering it is totally fat free it was very tasty and filling. I had some tofu which desperately needed using up so I made a batch of Tofu Bacon. I usually prefer tempeh or seitan for my salty smoky breakfast needs, but this made a very pleasant change indeed. I had some in a sandwich with tomato ketchup, and I used the rest stir fried with cabbage, dill and onion as a base for potato pierogi with sour cream. It was excellent both ways and I’d make it again. The next meal was my favourite of the challenge by a mile. 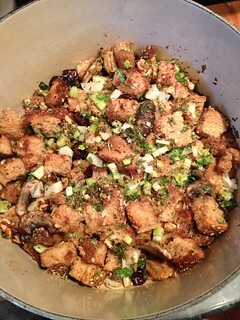 I made the Bread Stuffing Casserole with Golden Gravy (and roasted broccoli not from the book). I adored this meal. The casserole was very easy and a brilliant use for leftover slightly stale bread. It’s mixed up with vegetables, herbs, dried fruit and nuts and baked. I’m not always a big fan of dried fruit in savoury dishes but this was great. The golden gravy was rich, salty and creamy and a perfect accompaniment to the casserole. The Macaroni with Tomatoes and Cheez was on the menu last week because I hadn’t been shopping at all and it was made from entirely store cupboard ingredients. I threw in a bit of frozen spinach which added a green vegetable but did not help the look of the dish! It was a comforting hearty pasta dish which wasn’t as rich as a pure mac and cheese but richer than a tomato sauce pasta. Unsurprisingly not my favourite cheesy pasta dish but I’d make it again for a midweek standby dish. 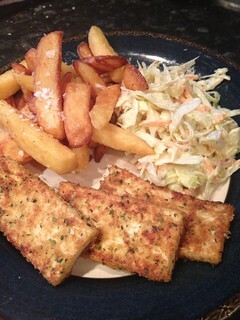 My tenth recipe from this book was the Southern Fried Tofu which I served with chips and coleslaw. I love Southern Fried anything. This blend had more nutritional yeast than I would normally use, and it worked very well. Matthew has eaten chicken more recently than I have and said it tasted just like it. The texture wouldn’t fool anyone but it tasted delicious. Like most similar recipes there was way too much of the flour, milk and spice blend, but I’ve saved the spices blend leftovers to use with either seitan or tempeh another time. So overall the results of my Jo Stepaniak testing were very positive. The books don’t have any pictures of the food, which doesn’t especially bother me but may explain why I don’t reach for them too often. They’re definitely hearty, comforting food – no fancy swirls or fiddling around, so they’re perfect for busy people and families, but probably not so much for dinner parties or impressing sceptical meateaters. The recipes hardly use any processed or fancy ingredients like bought cheeses or meats so they’re also very useful if you don’t have access to storebought products or are on a budget. There are still plenty of recipes I want to try from these books, so if you’ve used them a lot please let me know your favourites!